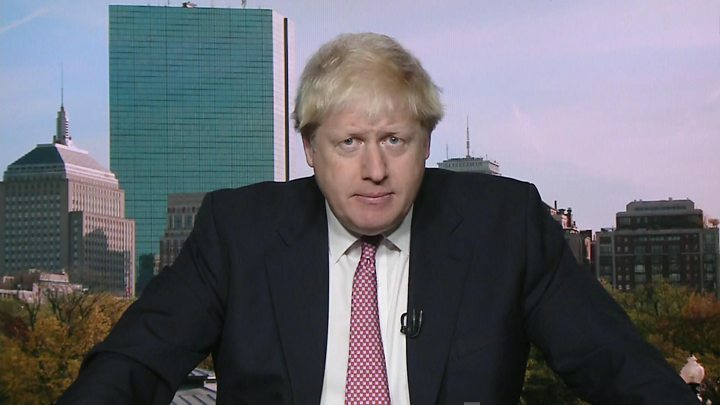 Media captionBoris Johnson: "Russians respond to the idea ... that they are in the dock in the court of international opinion"
UK Foreign Secretary Boris Johnson has suggested Russia may have committed a war crime in Syria if it was behind an attack on an aid convoy near Aleppo. He told the BBC's Andrew Marr Show that it was right to ask whether Russian forces had deliberately targeted civilians. Eighteen lorries and a warehouse were destroyed and 20 people killed in last Monday's attack. Russia denied responsibility, blaming rebel shelling or a US drone. Mr Johnson also said Russia was "guilty of protracting" the war in Syria and of "making it far more hideous". 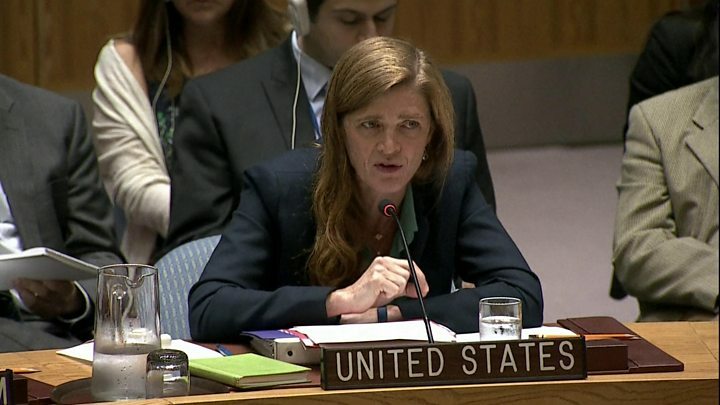 Media captionUS Ambassador Samantha Power accuses Russia of "barbarism"
His comments came as Aleppo sustained heavy bombing, with the Syrian government saying it had launched an offensive to retake rebel-held areas. In the latest fighting, rebel forces in the city were reported to have retaken the Palestinian refugee camp of Handarat, on elevated ground north of the city. The strategic area fell to government troops on Saturday. The UN Security Council is due to meet on Sunday morning in New York to discuss Aleppo. The meeting was requested by the US, the UK and France. United Nations special envoy Staffan de Mistura described last week's attack, on an aid convoy and Syrian Arab Red Crescent warehouse outside Aleppo, as an "outrage". The US said two Russian warplanes were involved in the attack. Mr Johnson appeared to go further, saying the convoy could have been deliberately targeted. Russian President Vladimir Putin was "not only... handing [Syrian President Bashar] Assad the revolver", he told the BBC's Andrew Marr programme. "He is in some instances actually firing the revolver himself. "We should be looking at whether or not that targeting is done in the knowledge that those are wholly innocent civilian targets. That is a war crime." The attack prompted the UN to temporarily suspend aid deliveries in Syria. Heavy bombardments of rebel-held areas of Aleppo by government forces have continued throughout the week after a truce brokered by Moscow and Washington collapsed. UN chief Ban Ki-moon was "appalled by the chilling military escalation" in Aleppo, his spokesman said on Saturday. "Since the announcement two days ago by the Syrian army of an offensive to capture eastern Aleppo, there have been repeated reports of air strikes involving the use of incendiary weapons and advanced munitions such as bunker-buster bombs," the statement said. The northern city of Aleppo has become a key battleground in Syria's bloody five-year civil war. The UN says the attacks on Aleppo have left nearly two million people without water. UK-based group monitoring the Syrian Observatory for Human Rights said 25 people were killed in bombardments on Saturday. Activists say both Syrian and Russian warplanes are taking part in the latest offensive, though Russia has not confirmed its involvement. Russia supports the Syrian government, while the US backs the opposition. The two powers accuse each other of failing to rein in their respective allies on the ground.